With millions of customers set to benefit from faster, easier and more convenient contactless journeys around London from 16th September, Visa Europe crafted an immersive 3D art installation at Waterloo station to mark the occasion. 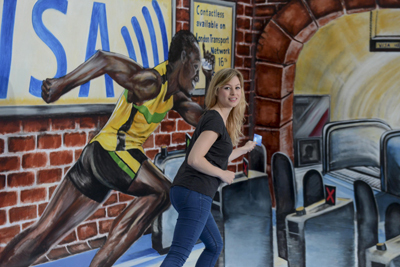 The image enables passers-by to join Visa Ambassador, Usain Bolt, in a race to the London Underground gates where they can touch their contactless card on the reader to pay directly for their journey. Contactless journeys – using credit, debit, charge or pre-paid cards or devices – work in the same way as Oyster on TfL services, by touching in and out on the readers at the start and end of every journey. Fares are cheaper than cash with users being charged adult pay as you go fares and benefitting from daily and Monday to Sunday fare capping. The availability of contactless journeys on all TfL services coincides with new figures released by Visa that show the use of contactless across the UK has continued to gain pace. In June 2014, the use of contactless cards to make payments increased month-on-month by 7%, reaching a total transaction value of £136.4 million. This also indicates a growth in contactless use of 207% since June 2013, with the transaction value increasing by 202%.